Market sentiment is improving with fund managers predicting a sustained rise in Indian equities this year, finds the fourth edition of the BT Morningstar Asset Allocation Survey. Gopal Agrawal has been busy reshuffling his portfolio over the past two to three months. The chief investment officer at Mirae Mutual Fund is doubling his exposure to mid-cap shares and buying stocks in the energy, capital goods, metals, auto and infrastructure sectors. In short, he has turned bullish. Why? "Macroeconomic concerns have eased as the current account deficit is under control, exports are strong and the rural economy is in good shape," he says. "Indian equities will likely see a broad-based rally in 2014 as against a narrow movement last year." Agrawal's view is backed by S. Krishnakumar. The head of equities at Sundaram Mutual Fund says Indian stock markets will benefit as the global economic uncertainty eases with growth returning to the US and Japan. Krishnakumar believes that a global recovery will especially help export-oriented sectors such as software services, pharmaceuticals and textiles. Agrawal and Krishnakumar are among a growing number of fund managers betting on a rise in Indian stock markets. In the fourth Business Today Morningstar Asset Allocation Survey, 55 per cent of fund managers polled expected the Bombay Stock Exchange's benchmark Sensex to trade between 21,000 and 23,000 at the end of 2014. The remaining predicted the index to stay above 23,000. 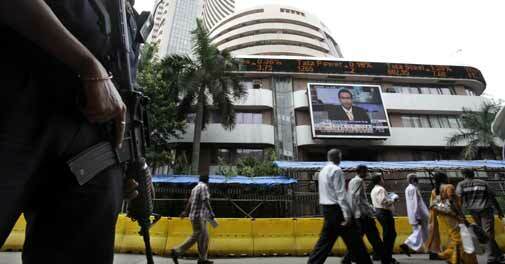 In the survey's third edition in October 2013, only 15 per cent expected the Sensex to stay above 20,000. The benchmark rose nine per cent in 2013 to cross the 21,000 mark, led by select stocks such as Tata Consultancy Services and ITC. The expectation of an improvement in macroeconomic conditions is not the only reason for the bullish undertone. Nearly 90 per cent of the fund managers surveyed said the Bharatiya Janata Party-led National Democratic Alliance (NDA) had a high chance of ousting the Congress-led United Progressive Alliance in the general elections due by May. 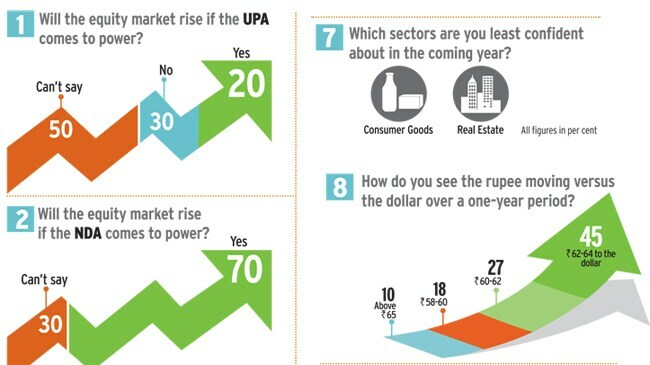 Seventy per cent of those polled feel stock markets are likely to rise if the NDA comes to power. Krishnakumar says the new government should push reforms that are essential to revive an economy growing at its slowest pace in a decade. The optimism among fund managers is evident also from improved predictions for the Sensex's price-to-earnings ratio. Nearly two-thirds of the fund managers feel the indicator used for valuing stocks is likely to hover between 14 and 16 times forward earnings over the next one year. More than a quarter expect the ratio to be between 16 and 18 times forward earnings. In October, 46 per cent of those surveyed saw the ratio falling below 14 times forward earnings. The latest survey shows more fund managers are favouring mid- and small-cap stocks over large-cap shares. Krishnakumar says he plans to increase the share of mid- and small-cap stocks in his portfolio to 25 per cent in coming months from 15 to 20 per cent currently. He adds that mood among fund managers who are ready to take more risk is changing in favour of mid-cap stocks. In the October survey, no fund manager wanted to take more than 50 per cent exposure in mid- and small-cap stocks. In the latest survey, 27 per cent are willing to invest half their portfolio in such shares. Apart from shares, fund managers are looking to take more risks in the debt market as well. The survey shows that 30 per cent of those polled expect to increase their exposure to lower-rated debt in the coming year while 60 per cent want to stay steady. In the previous survey, 62 per cent were reducing the share of lower-rated debt in their portfolios and nobody wanted more exposure. The survey shows also that fund managers see some improvement in the Indian economy. Nearly three-fourths expect gross domestic product to grow at five to 5.5 per cent and 91 per cent expect the fiscal deficit to be less than five per cent. Unlike the previous survey, a majority of fund managers expects the Reserve Bank of India (RBI) to cut interest rates marginally in the next one year. Around 55 per cent expect the repo rate - at which banks borrow from the RBI - to be in a range of seven to 7.5 per cent from the current 7.75 per cent. No fund manager expects the repo rate to fall below seven per cent. The survey shows more fund managers than before expect the rupee to stabilise at current levels. The rupee is hovering around 62 to a dollar. Around 45 per cent of those polled forecast the rupee to remain between 62 and 64 versus the dollar over the next one year. In October, only eight per cent expected the local currency to stay in that range. Like the last survey, half the fund managers continue to see crude oil prices around $100-110 a barrel. But 30 per cent see oil prices falling to around $90-100 a barrel. The latest survey also finds worsening sentiment regarding gold. Half of those polled maintain a neutral position on the yellow metal, compared with 43 per cent before. One in five has a positive outlook on gold, down from more than one-third in the previous survey, while the remaining are pessimistic.